There were endless cups of billy tea, guitar, card games and laughs under the corrugated iron roofed outdoor kitchen outside JR and Margie’s place at Milibinyarri. Perched at the top of the hill, you could sit in the shade with a hot cup of tea in hand and look out at the crystal blue ocean from that outdoor kitchen. I first came to sit atop that hill with JR on my first visit to Broome in 2000. I was walking the Lurujarri Dreaming Trail as part of an RMIT University group and met him and his young family on my arrival at Milibinyari, the Goolarabooloo community’s block out at Coconut Wells. After walking the Lurujarri Trail with JR and his family that year I stayed on at Milibinyarri and worked on a report about cultural perspectives of burning country with the Goolarabooloo community. I recall my keenness to speak with JR about his perspectives; not a day went by when I wouldn’t ask him if we could sit down and ‘have a chat’ about burning country. His response, ‘Later better maybe,’ became familiar to me and fueled my anxiety about getting the report ‘done’. Little did I realise that every conversation, every story needs to be told in the right place, at the right time. I was sitting in the shade of the outdoor kitchen on my last day at Milibinyarriwhen JR came up and said that now was a good time to talk. Silly me, I pulled out my notebook and pen, poised and ready to learn (I was young and green and had no idea about just sitting, listening and being with). 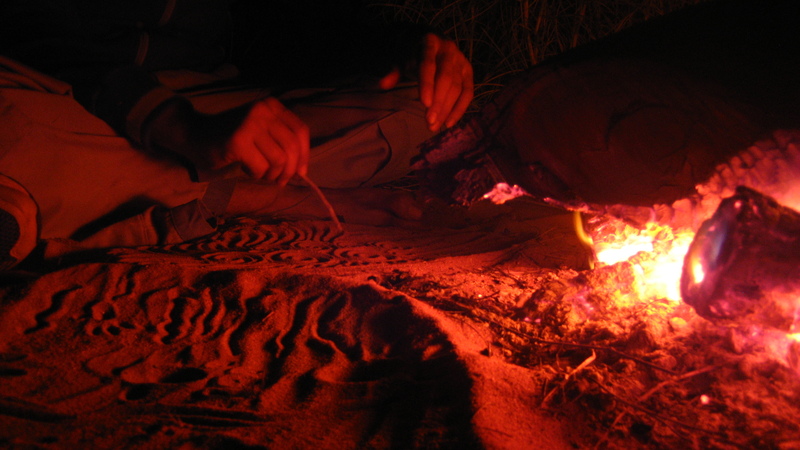 JR just looked at the contents of my hands and said, ‘You don’t need that stuff.’ Sitting on the edge of his verandah, he bent over and drew in the red pindan, teaching me about fire, about burning country. JR’s storytelling that day was brief and laden with distilled wisdom. Not a word was wasted. Since then I’ve returned to Broome to spend time visiting JR and his family and their country; sometimes walking and volunteering on the Trail, other times just to visit and spend time fishing, camping and laughing under the corrugated iron roof. As the years have passed the door has always been open and the friendship unconditional. I never felt like a tourist or visitor to Milibinyarri, I was welcomed as a friend. The outdoor kitchen with its corrugated roof no longer stands in that place and much has changed on that country, as have the relationships that bound us together. JR had a big job, to look after his country and people, but he always had time for a cup of tea and a chat and to teach me a little bit more about being with country and myself.